Winter went on for ages, moods are grey. Now it’s time for some colour! Off to Holland, to the land of Tulips and Hyacinths, of Jonquils and Narcissuses. 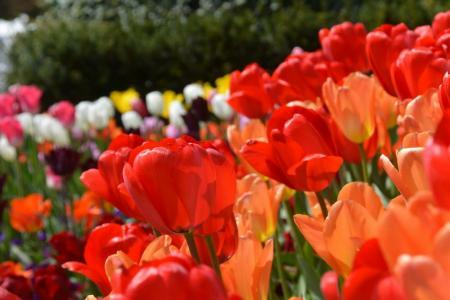 In the Keukenhof botanical gardens, hundreds of growers will conjure up spring, while Aalsmeer is home to millions of flowers being auctioned off. But even on smaller markets in Haarlem or Amsterdam you will see glowing tulips in all their splendor. Make a start into the bright season on this easy tulip tour from Amsterdam with the MS Fluvius. Embarkation until 5 pm; while you dine the ship will take you to the cycle tour’s starting point. First you will enjoy an extended visit to the well-known open-air museum, then you will get to know the beautiful city of Haarlem and the seaside. Keukenhof botanical gardens offer millions of spring flowers - fresh colours after the murkey grey of winter. Early in the morning you can experience the world’s largest flower auction. Later you will do some cycling and discover the city of Amsterdam. The tulip tour concludes after breakfast. Your luggage can stay aboard the Fluvius until approx. 3:30 pm if you feel like exploring Amsterdam a bit more. Here are the details on MS Fluvius. We offer comfortable unisex-bikes with 7-speed gearboxes and coaster brakes or freewheel, equipped with a bike bag and a bike lock. We also offer e-bikes if desired. Minimum number of participants: 16. This tour can be cancelled by the provider up to 22 days prior to its commencement. If this is the case, we will strive to supply our customers with an equivalent offer. - Drive to the car park Oosterdok near Amsterdam Centraal station. Costs are approx. EUR 140 / week. - Make use of our parking service from Centralparking. We will arrange for your car to be picked up from the quay, stored safely and returned to the ship. Your vehicle is insured against all types of damage or theft and will be parked in a protected underground facility. Cost: approx. EUR 150 / week. - Make use of the free parking space P&R at the train station in Weesp. Back to Amsterdam Centraal station by train, duration approx. 15 minutes, cost approx. EUR 4. Amsterdam Centraal station, get the 48 bus to the quay, duration approx. 10 minutes, cost approx EUR 3. Alternatively, get a taxi from the airport to the quay, cost: approx. EUR 45 per vehicle. There are several private and scheduled providers, see e.g. here. In principle, you can bring your own bike along. However, please note that your bike will be loaded on and off the boat twice a day along with several others and therefore slight cosmetic damage to individual bikes cannot be ruled out, which is why we do not take responsibility or liability for such damage. We recommend reserving one the excellent rental bikes we offer.